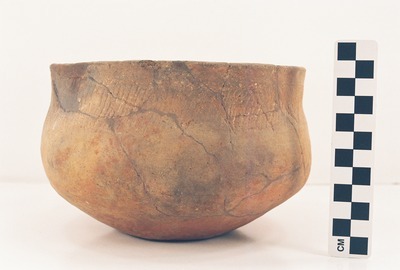 "41AN1-8, Burial E-2" by Timothy K. Perttula and Robert Z. Selden Jr.
DECORATION: There is an engraved panel (defined by upper and lower horizontal lines) on the upper part or rim of the vessel. The panel is comprised of 36 alternating engraved triangles in six distinct sets. Thirty-one of the engraved triangles have diagonal hatched lines within the triangles, while one set has five triangles with horizontal hatched lines within them. Poynor Engraved, var. Q bowl (Vessel 41AN1-8).